The automatic faucets sub-category includes smart faucets and accessories that use SST technology. Automatic faucets are great for restrooms as they help prevent the spread of germs. Unlike traditional faucets, automatic faucets do not requires the user to physically turn a knob on or off. When people have to turn their faucets off, it contaminates their freshly washed hands, taking dirty germ particles off the handle and spreading it to whatever else they touch. 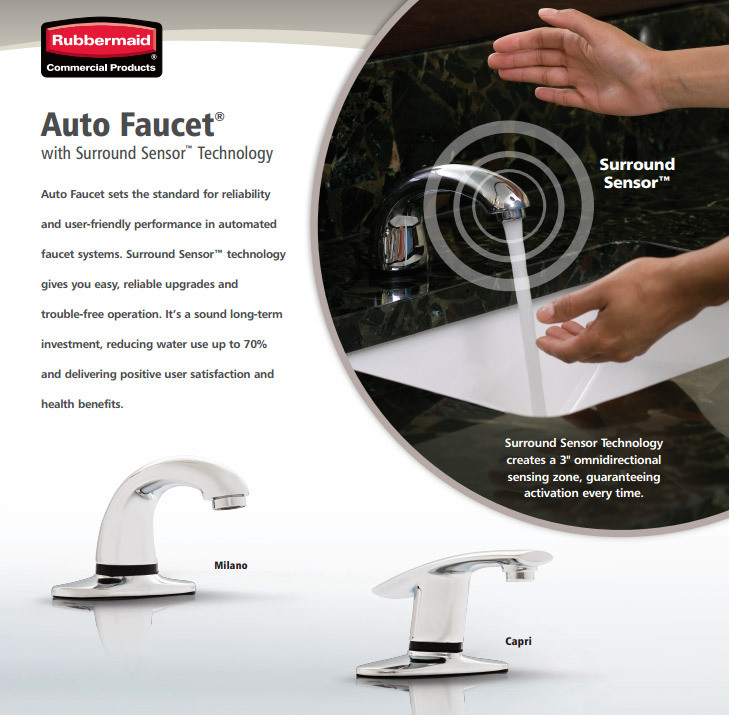 Find products like Rubbermaid's Milano's Automatic Faucets. Milano's Automatic Faucets have a 3 omni-directional sensing zone. Users will not have to struggle to search for the sensing zone when they want to wash their hands. Rubbermaid's Milano Automatic Faucets have an extremely long battery life. It will last for 3 years or 400,000 cycles. The Milano Automatic Faucets use four D batteries. The automatic faucets sub-category includes replacement products as well. Thermostatic Mixing Valves are important because it keeps water temperature comfortable, allowing users to choose the amount of hot and cold water they want in a single stream. The mixing valve allows users to choose a temperature between 80-120°F. The automatic faucets sub-category is a great section for public areas. Its easy for public areas to become contaminated because of its high traffic. Automatic faucets reduce disease, especially in restrooms. At Public Kitchen Supply we strongly encourage businesses to install automatic faucets in their restrooms.